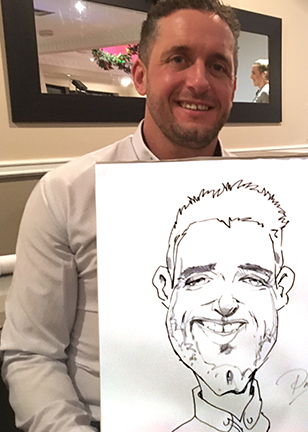 I have been keeping guests entertained as an Event Caricaturist creating fun caricature portraits with great likenesses for 25 years. 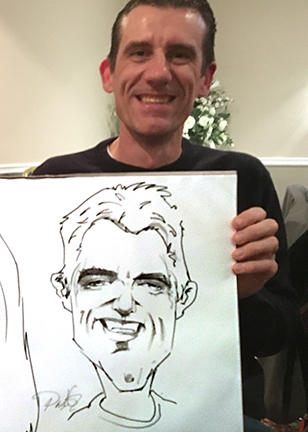 The caricature portraits take me about 7-10 minutes each to draw and are drawn in black and white pen with grey tint marker shading. I have been drawing and entertaining people with fun caricatures and portraits for 25 years, with periods spent working in Australia and India. I cover mainly London and the South East but will travel further if requested to do so. 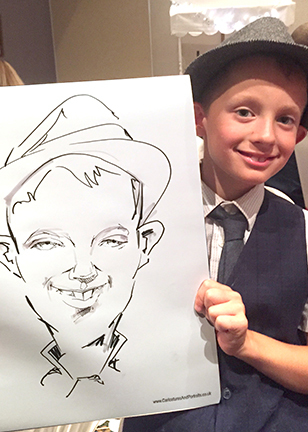 The Events I draw at include:- weddings, children’s parties, corporate events, birthday parties, school leavers parties, anniversaries, summer parties, garden parties, civil weddings, confirmations, christenings, Bar Mitzvah’s and many others. I travel to Kent, Sussex, London, Buckinghamshire, Surrey, Essex and other counties. If you think it would be great to have me attend, whatever the event then please get in touch! Click here to contact me and check my availability. 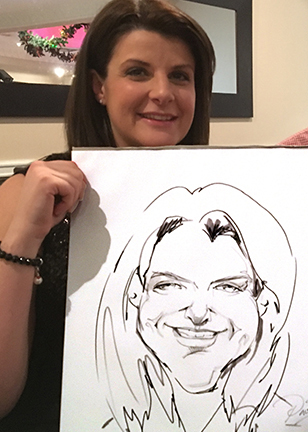 When I arrive at the event I invite guests to have a caricature drawn by going discretely from table to table or the hosts make an announcement that I am attending the event. I usually find a well lit part of a room at the event and set up a comfortable area for sitters to relax (usually prearranged). Once my sitter is comfortable I chat to them about interests in a relaxed and friendly way to make their experience as enjoyable as possible. I tend not to exaggerate the facial features but draw more of a fun portrait with a real likeness. The drawings are always complementary. My sitters love the drawings I do of them, and I hear, get them framed as mementos of the occasion they attended. 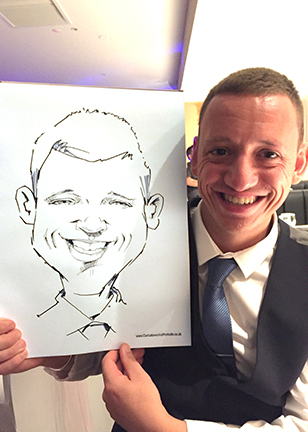 To book me as an Event Caricaturist including Weddings and Parties I charge from £100.00 per hour, minimum 2 hours and over 1 hours travel time minimum 3 hours etc. Please contact me to check availability. I cover London and the South East of England including:- Kent, Surrey, Sussex, Hampshire, Middlesex, Hertfordshire, Buckinghamshire, Berkshire, Oxfordshire and Essex. For corporate functions please apply for a quote. It’s a great way entertain children. Let your guests have a memento. Your guests will love watching me. Seeing a drawing develop is great. and many weddings and parties.